LEFT: The Hotel Blyss is next to the Vondelpark, about a five-minute walk from the Rijksmuseum. The Blyss has 40 rooms, including family-size quads and suites. You can reach the Vondelpark in a minute or two for your morning jog, and the bars and nightclubs of the Leidseplein are a short walk from the hotel. Babysitting is one of the services offered by this two-star hotel in central Amsterdam. The Clemens has single, double, and triple rooms with or without private bath. This 16-room hotel is a former East India Company sea captain's residence. It has modern furnishings and is just off the Frederiksplein. 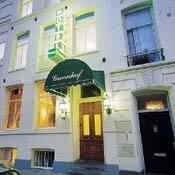 Five historic buildings between the Herengracht and the Keizersgracht were converted into a family-run hotel in 1998. All rooms have private baths, and most have at least partial canal views. Singles, doubles, triples, and quads are available, and public parking is within walking distance. Every room is different at the ITC, which occupes a renovated 18th Century canal house on the Prinsengracht. The 20-room hotel has its own bar and is only five minutes from the Rembrandtplein. Check discount rates at hundreds of hotels, B&Bs, apartments, and houseboats in Amsterdam. Most listings include reader ratings and reviews.